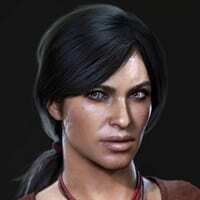 This article contains information about Chloe Frazer for the game Uncharted: The Lost Legacy. Chloe Frazer is an Indian-Australian treasure hunter that appears in Uncharted: The Lost Legacy. She is a recurring character throughout the Uncharted series. Chloe Frazer worked with a variety of people such as Nathan Drake, Victor Sullivan, Harry Flynn, and different other characters. Her most commonly worked with partner was Nathan Drake with whom she had a romantic fling with. She initially sought out the Amber Seal in order to discover the Amber Room in Agartha, causing them to end up working together alongside Victor Sullivan. She saves Nathan a couple of times which then leads to their relationship. However, this soon dissolves when they meet each other in Uncharted 2: Among Thieves. Nathan and she argue about him walking out on her. However, the two soon reconcile and run away together after gathering their profits. She works alongside Elena Fisher and Jeff. Elena, who initially had hostility towards Chloe, soon became friends when Nathan explains why Chloe initially abandoned them. However, in Uncharted: The Lost Legacy, she works alongside Nadine Ross. Their main target is the Tusk of Ganesha in the country of India. Chloe Frazer can be seen as someone who is straight-forward and committed to her work. Because of her caucasian descent, many of the characters say she is beautiful which is matched also by her skill as a Treasure Hunter. She also has a bold side to her, as she is seen taking treasure hunting jobs that most hunters would not. Many of her treasure hunting jobs often times threw her into the heat of combat. Hence, Chloe knows some marksmanship and also has a degree of martial prowess. While many say that she cares for her friends, some say also she has a strong degree of self-preservation. This makes people wonder and uneasy as to when Chloe would suddenly turn on them.